The traditional soda bread is made with only the basic ingredients of flour, baking soda, salt along with buttermilk to moisten and activate the soda. No kneading is involved with the ingredients mixed in with minimum handling to yield a soft bread. Before baking, a cross was cut on top with a knife to ward off the devil and protect the household. Scientifically, it also allows the heat to penetrate into the thickest part of the bread. This bread was introduced in the early 1800s when people had no ovens. They cooked the bread in a big cast-iron pot with a lid on it that was put right onto the coals or over fragrant turf fires. If you have never baked bread before, then you can start with this bread. 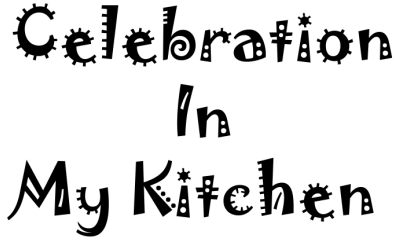 It requires no yeast, kneading or proofing and ready within an hour. Recipe for this bread is from Epicurious website with some variations. A simple and easy recipe resulting in a moist, airy bread similar to a delicious scone. 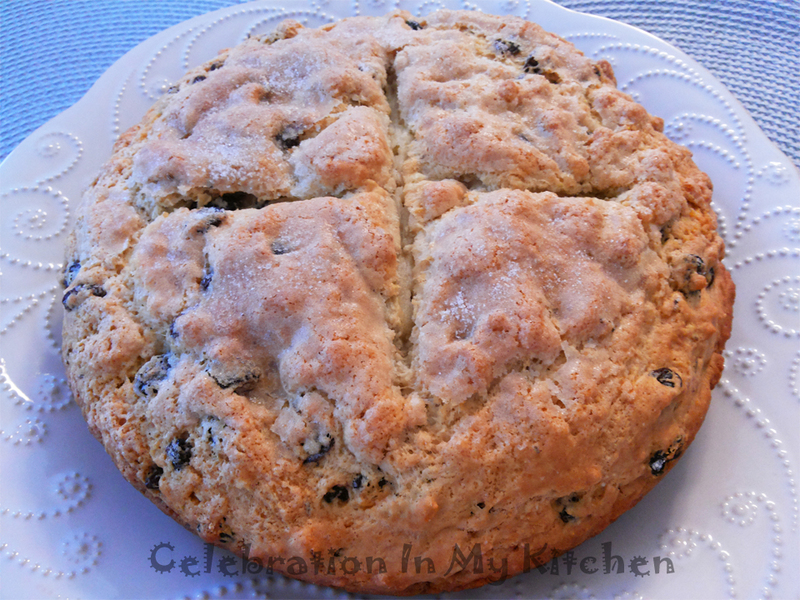 The outer crust is crunchy with a soft, light centre, perfectly sweeten with the sugar and raisins. My husband and family loves this bread, one that I bake for them every year on St. Patrick’s Day. The bread slices are lightly buttered and served with a cup of hot tea. Why is it called Soda Bread? It is a type of quick bread that uses baking soda as a leavening agent. The reaction between the buttermilk and baking soda produces bubbles of carbon dioxide, causing the dough to rise yielding a hearty, dense, moist bread. 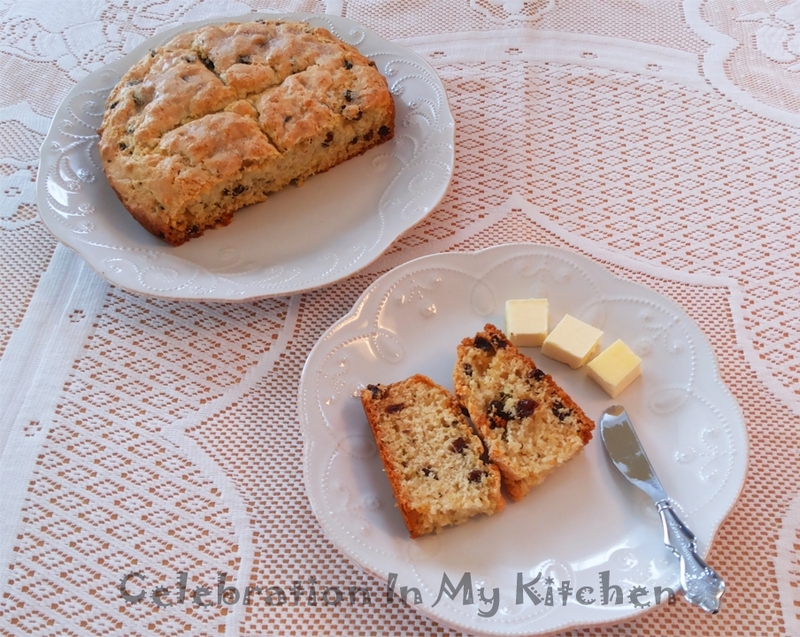 Addition of ingredients like sugar, butter, raisins and caraway seeds enhance the flavor and texture of the bread. 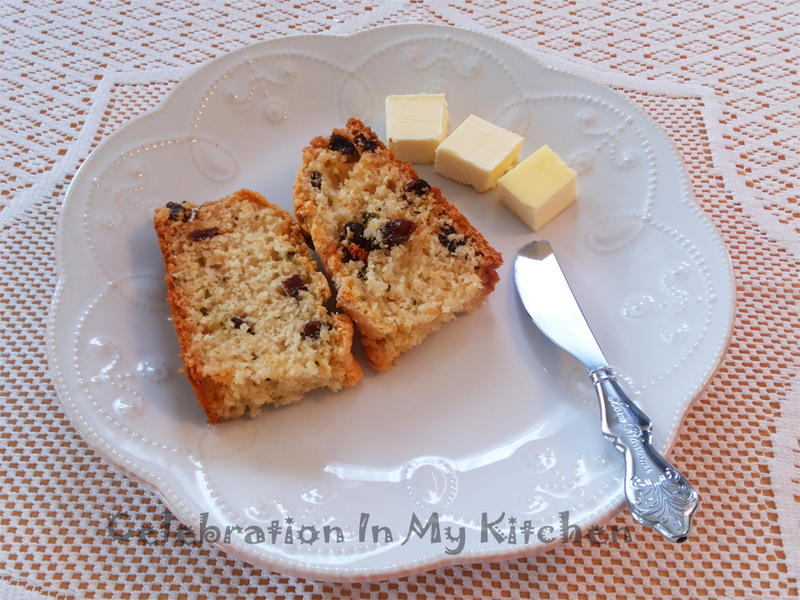 Soda bread with raisins is called spotted dog or railway cake. If it contains raisins, eggs, baking powder, sugar or shortening, it’s called cake, not bread. Plump raisins in 1 cup hot water for 15 minutes and drain well. Alternatively, you could use some Irish whisky, rum or orange juice. ​Preheat oven to 350 F or 180 C.
Grease a 8" cake pan with butter. Sift flour, baking powder, salt and baking soda in a bowl. Mix in the sugar and add cold butter cubes. With a pastry blender, cut butter into the flour until it resembles coarse crumbs. Stir in raisins until evenly coated with flour followed by the caraway seeds. Make a well in the center of the flour mixture. Add buttermilk and with a fork stir until all the liquid is absorbed and the mixture begins to hold together (it will be sticky). Using a spatula transfer to prepared pan (dough will not come to edges of pan). Sprinkle dough with remaining 1 teaspoon sugar and make a cross in the centre using a sharp knife. Bake bread until brown and tester inserted into centre comes out clean, about 40 minutes. Cool bread in pan for 10 minutes. Transfer to a rack. Serve warm or at room temperature.